You’re planning your next vacation, and whether it’s your dream vacation, a family trip or a brief getaway, you need to decide if you’re going to hire a travel agent or try booking the trip yourself online. The travel sites can be very confusing. There are so many travel sites, which one do you choose? You can spend hours researching your trip – your time is worth as much or more as you think you’re saving by doing the work yourself. You can’t find the flights you want, at the times you want, for the price you want. You choose the flights you think will work best for you, you click on the wrong button and everything disappears and you can’t find it again. Once you’ve booked your travel, if changes need to be made it’s either extremely expensive or next to impossible. Anticipating your vacation is supposed to be fun, but doing your own booking is anything but fun! Travel Agents Can Make Travel So Much Easier! 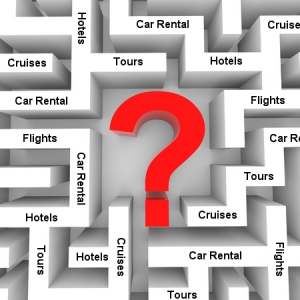 Travel agents are trained professionals, we know how to sort through the maze of all things travel. Not only do we love to travel ourselves, but because we have planned so many trips for so many people, we have so much information at our fingertips about all the things that will make your trip pleasant, more affordable, more interesting and more convenient. One of the best things we’ll do for you is hold your hand through the entire process of planning. From start to finish (yes, even while you’re on the trip) we’ll be there to answer your questions and help you through any problems you may encounter. We can give you more bang for your buck, because we know about ground transportation, places to stay away from, places to see that you may never have heard of, we have the low down on hotels and restaurants and if there are any great tours where you’re going. We have partnerships and connections that can help get you some great deals, and we know how to negotiate for you. We can help you benefit from unadvertised specials too! Travel Agents are alive and well! Call me for your next trip…you tell me what you want, and I’ll arrange it!